I have been busy (as I have said) with our upcoming contest. And since I cannot blog and do my online jobs on the morning, I have to stay awake longer. My sleeping habit had changed since Monday. My bed time now is always past midnight and I should be awake at around 4. Physically, I am OK with it but my skin is suffering from lack of sleep. I can see that my forehead is now decorated with acne. Right now, I want to drink acne pills to prevent it from getting worse. This is something that I cannot tolerate, I am so ugly with acne. Don’t tell me I should stop blogging at night because I can’t. But if you really want to help me, please, pretty please, read my previous entries about our contest mechanics. Read it and read it carefully. It would really make it easier for us if you have less inquiries. Don’t worry though, we would entertain inquires, however small or trivial it is. My sister with her 3 year old (will turn 4 this January 20) son is still here. And I am throwing a small children’s party for him. Remember that my whole family spend the holidays here? I had so much fun then and it was one of the best holiday for me . If there is one thing that I wish I had then, it would be more bathrooms. Last December 27 was Sati’s christening and we all end up knocking on the bathroom door so the one using it would take a bathe faster. It was stressful that we all need to take a bath and there is only one bathroom for all of us. Imagine, me, the hubby, my 4 siblings, two have their partners with them, my mom, two helper and 5 kids. All in all, we were 16! And yes my house were packed then. It was more stressful when one of the kid need to use the bathroom and somebody is using it. You know kids cannot control their bladders. It was funny to watch them dancing and knocking on the bathroom door but it is irritating for the on using the bathroom. Oh how I wish I can have a house with two to three bathrooms on it. After the depression attack, comes the OCD attack. Oh please don’t come near me, I am impossible this past few days. And while we were busy taking everything out here in the house, I suddenly want to cook, and not just one, but two dishes. In the fridge, there’s ground pork and ground beef. I cooked it both! Yum! For the ground pork, I just saute it in tomato sauce and I add some carrots and potatoes in it. For the ground beef, I cooked chili con carne. It is not your typical chili con carne with black beans. 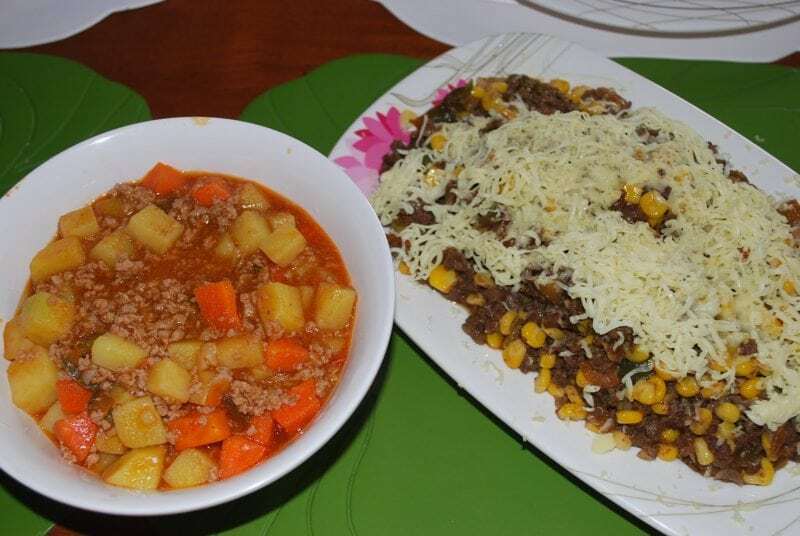 It is a simple chili con carne, coked using Taco mixture, with some corn kernel and topped with cheese. I think I would need cholesterol treatment, because I ate twice. I ate with my sister then I breastfeed Sati. After that I ate again, this time with my helper. But in a way, I really need that much energy because there a dozen boxes outside waiting to be sort out. This is what happens when my OCD attack, I tend to perform all the roles tha I can fit, mom, cook, home make, etc. You don’t have to tell me, I know I need to rest too.